WPTools also offers superb support for paragraph styles such as ‘Headline1’ which are well accepted features of ‘big’ word processing programs. Because of the new code it is possible to set each attribute of a character or paragraph to be “undefined”. If an attribute is undefined it can be defined by an element which has lower priority (i.e. inherited attributes). This concept includes the ideas of Cascading Style Sheets (CSS) which are used with HTML files. Especially for the style support it payed off that this feature was well integrated into the architecture. We are talking about the new way which is used by WPTools 5 to store attributes. Because of the new code it is possible to set each attribute to be “undefined”. If an attribute is undefined it can be defined by an element which has a lower priority. 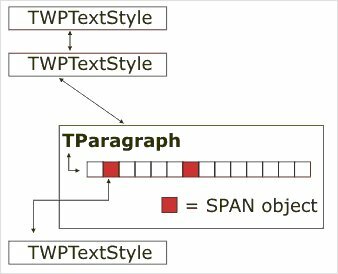 So all attributes which are undefined by a paragraph are read from the attached style or the base style which is used by this style. This concept covers characters, paragraphs, tables and even text blocks, such as header ot footer texts. Note: WPTools can handle the important CSS attributes, but not all the possible attributes are supported. It also has to simplify the documents to something which can be saved as RTF. Only in our “WPT” and in the RTF format all properties can be also saved.